It is among the five activity module of Fragrance & Flavour Development Centre, Kannauj. The basic objective for creating this division in the centre has been for augmenting the Chemical Engineering / Technology need of essential oil, perfumery and aroma chemical industry in the country. There has been a demand in the industry from various platforms for bridging the gap between processes developed in laboratories and commercialized processes used by industry. 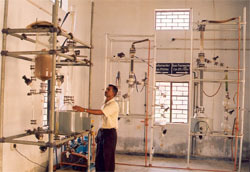 Keeping in view, the constraints of Research & Development Institute for scaling –up the developed processes, a semi-commercial scale pilot plant facility for processing of essential oil, perfumery and aroma chemical has been created in the Centre. 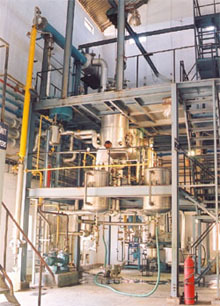 The other objective for creating semi-commercial scale processing facility in the Centre are process condition standardization of essential oils & aroma chemicals, process development for processing of essential oils & aroma chemicals, process development for value addition in essential oils and providing common facility to industrial units in processing of essential oil on job work basis on the lines of developed & standardized processes. 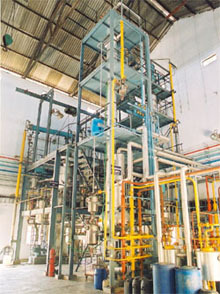 Value addition in essential oils for increasing share of margin, a multiferial reactor capable of handling diverse chemical reactions is also a part of pilot plant. Charge Capacity - 200 Kgs. 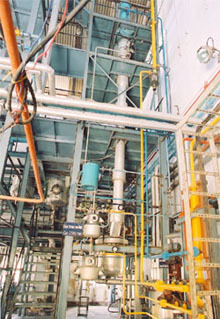 The reaction assembly coupled with fractional distillation column can as well be used for manufacture of drug intermediates also, while it is idle for aroma chemical manufacture. 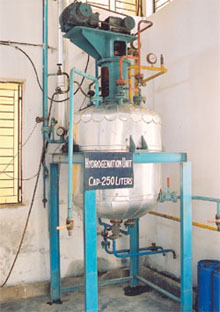 A Hydrogenation unit for value addition in essential oil & aroma chemicals by reduction process has recently been added to pilot plant facility. This unit has been designed to operate at 120 Psig. Pressure & 150 c temperature with jacket & spiral stiffeners facility. Unit is designed to handle a number of aroma bearing plants , flowers , roots , herbs and other products at different process conditions for carrying out studies & standardization of process condition. Solvent extraction unit can handle manufacture of concretes, resinoids, oleoresins and absolute from flowers , resins , gums & spices. For solvent recovery in traces , this unit is attached with stripping / Solvent Recovery unit with appropriate heating & vacuum arrangements. Change Capacity - 150-200 Kgs. 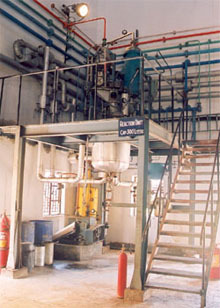 A fractional distillation unit with arrangements to operate it at reduced pressure & indirect heating system for processing of essential oils into isolates and aroma chemicals to a high degree of purity with acceptability to perfumers/flavourist is the attraction of this unit. This fractional distillation column is equipped with pneumatically controlled reflux divider with automatic timer and temperature sensors at all segments of the column for efficient operation and better separation of the isolates. 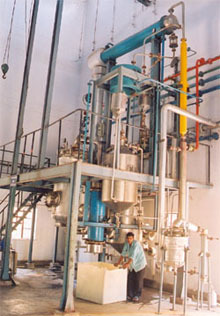 Menthol processing unit for menthol flakes & bold crystals with arrangement to separate the mother liquor from the product is also a part of pilot plant. Charge Capacity - 700 Kgs. Charge capacity – 60 Kgs.